MANASSAS, VA — The new Edward L. Kelly Leadership Center was built for Virginia’s Prince William school system at a cost of $37.5 million. Techniarts, the AV installer, chose Middle Atlantic furniture and equipment enclosures for all of the control and conference rooms. The 150,000-square-foot facility, for close to 500 employees, features a 300-seat meeting room with AV gear, a small museum in the main lobby; computer stations for people to fill out employment applications; and a meeting room for the School Board meeting room that can be divided into four areas, each with AV capabilities. Techniarts handled the AV installation with a technology budget of $3 million. Partnering with the Ennis Electric Company, Moseley Architects of Richmond VA, and the PWCPS Media Department, Techniarts outfitted the center with conferencing, AV, VTC and broadcast systems. Techniarts chose Middle Atlantic furniture and equipment enclosures for all of the control and conference rooms. As project manager Bill Moore described the project, “the building was considered an architectural success on the outside, and we wanted to keep the aesthetics top-quality and ‘matched’ in the interior spaces. “We were able to achieve a pleasing and consistent look for the control room and throughout the facility’s 20 control rooms,” Moore added. “We started with Middle Atlantic’s Broadcast LCD desk and expanded it substantially with the extra wide add-ons. The configurable Middle Atlantic desk has space for a technical director, audio operator, Chyron operator and robotics camera operator, up to six or more people. And, according to Moore, “the configuration was done easily with stock parts. The center’s 20 conference rooms feature AMX control, Panasonic displays, Tandberg VTC, Bi-Amp Audia and Nexia audio, Bosch Conference systems, EV and Renkus Heinz speakers and Crown amplification. 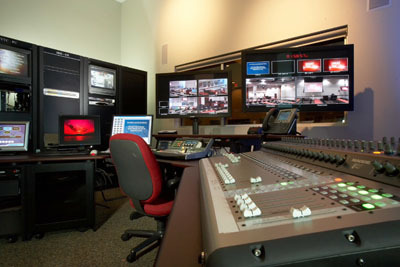 The Broadcast center is equipped with Pro-Bel routers, master control and automation, Omnion servers, Echo switcher, Pixel Power and Avid CG, Avid edit rooms, Sony SD cameras, Miranda monitoring with Panasonic displays. For more information, please visit www.middleatlantic.com.